Connecticut’s Hydrogen and Fuel Cell Day Aligns Companies, Lawmakers | Connecticut Center for Advanced Technology, Inc.
EAST HARTFORD, Conn. – October 8, 2018 – National Hydrogen and Fuel Cell Day is being celebrated today with support and recognition from Connecticut lawmakers and state leaders. U.S. Representatives John Larson (CT-1) of East Hartford and Elizabeth Esty (CT-5) were joined by New York’s Tom Reed (NY-23) to introduce a House bill and U.S. Senator Richard Blumenthal and U.S. Senator Chris Murphy joined a Senate move expressing support for designating October 8, 2018 as National Hydrogen and Fuel Cell Day. Today was chosen because it is symbolic of the atomic weight of hydrogen (1.008). Connecticut Governor Dannel P. Malloy officially recognized October 8, 2018 as Hydrogen and Fuel Cell Day in the State of Connecticut with a proclamation. “Our thanks to Governor Malloy, Congressman Larson, Congresswoman Esty, Senator Blumenthal, Senator Murphy, state DEEP Commissioner Robert Klee and everyone who has supported the efforts promoting the benefits fuel cells and hydrogen technologies provide in generating clean, reliable and resilient power,” said Elliot Ginsberg, CEO and President of the Connecticut Center for Advanced Technology. 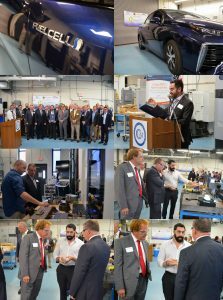 CCAT and the Connecticut Hydrogen Fuel Cell Coalition were joined by Klee, representatives from the industry, state and federal lawmakers at CCAT’s Advanced Manufacturing Center on Oct. 5 to mark the event. Along with Commissioner Klee in attendance, also celebrating with CCAT’s energy and manufacturing experts were those from Doosan Fuel Cell America, Fuel Cell Energy, Proton On Site, University of Connecticut, Precision Combustion, Inc. and more. Encompassed in the celebration was a tour of the AMC and a look at the latest fuel cell powered vehicle, the Toyota Mirai. The hydrogen and fuel cell industry in the Northeast region has experienced growth based on employment, revenue and investment, labor income, and state and local tax revenue. Currently, the Connecticut hydrogen fuel cell industry annually provides over $600 million in revenue and investment and over $30 million in state and local tax revenue to Connecticut. Further, with additional investment and deployment, the economic return from this industry could exceed $1 billion with another $840 million coming from the Connecticut supply chain. Hydrogen and fuel cell technology provides an opportunity for Connecticut and the region to more fully use its renewable energy industry with hydrogen and fuel cells for transportation, energy storage, and use at consumer sites. Such use could make the region a showcase for renewable energy while reducing greenhouse gas emissions as new jobs are created. This configuration will also increase local end user reliability which is of high value for businesses and industry. Hydrogen and fuel cell technology for transportation is also getting a major boost in the state with the completion of two, publically accessible hydrogen fueling stations in Hartford and Wallingford. These hydrogen stations will be able to provide hydrogen fuel for hundreds of zero emission fuel cell electric vehicles. As demand for zero emission fuel cell electric vehicles grows, more stations will be developed throughout the state. The use of zero emission fuel cell electric vehicles will reduce air pollutants in urban areas and add to the Connecticut economy. For more information on National Hydrogen and Fuel Cell Day, please visit www.hydrogenandfuelcellday.org. The Connecticut Hydrogen-Fuel Cell Coalition, administered by the Connecticut Center for Advanced Technology, is comprised of representatives from Connecticut’s fuel cell and hydrogen industry, labor, academia, government, and other stakeholders. CCAT and the Connecticut Hydrogen-Fuel Cell Coalition work to enhance economic growth in Connecticut through the development, manufacture, and deployment of fuel cell and hydrogen technologies and associated fueling systems. The CHFCC is supported by the State of Connecticut, CCAT, and its members. Connecticut Center for Advanced Technology Inc. (CCAT) is a nonprofit organization, headquartered in East Hartford, Conn., that creates and executes bold ideas advancing applied technologies, IT strategies, energy solutions, STEM education, and career development. By leading state, regional, and national partnerships, CCAT helps manufacturers, academia, government and nonprofit organizations excel. Learn more at ccat.us, or follow CCAT on Twitter – @CCATInc.